Unless Ferrari is really screwing with everyone, this is Ferrari's next one-off, an all-wheel-drive V12 supercoupe called the FFX. I can't say this is all true, but it doesn't take a lot of brainpower to put this conclusion together. On October 4th, Ferrari filed these patent drawings showing the car above. 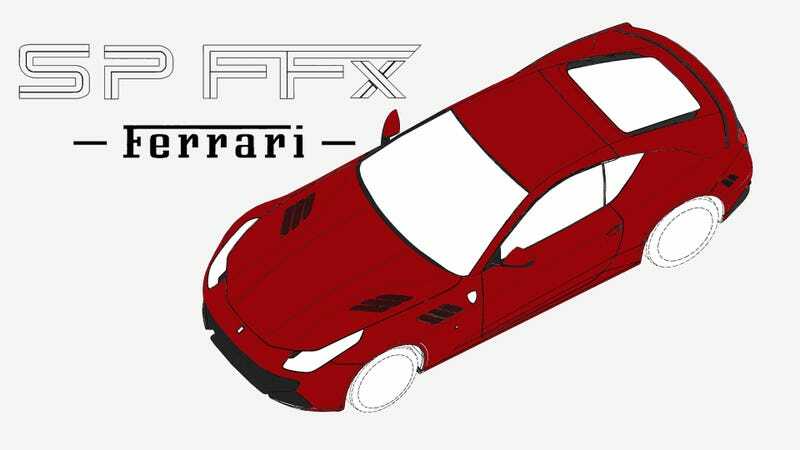 On October 4th, Ferrari filed this patent application for "SP FFX" and an accompanying logo. These two points need a bit more fleshing out for everything to be clear. Firstly, the patent drawings could be of the not-yet-debuted 2015 California. Autocar reported as much, and the car has the same three-vent motif as current and past Californias. However, the patent drawings showed the car with Ferrari FF door mirrors, headlights, taillights, and general proportions. It appeared, more than anything else, to be an FF Coupe. Secondly, SP FFX is a little unclear, but not if you're familiar with Ferrari's one-off naming strategy. The SP stands for Special Projects these days (as opposed to Sports Prototype), Ferrari's in-house coachbuilding division that makes one-of-one customs. So far they've made the F430 SP1, the 612 GTS Pavesi, the Superamerica 45, the P540 Superfast Aperta, Eric Clapton's 458 SP12, and the not-yet-public SP Arya. I think it's pretty clear what the 'FFX' part means, so SP FFX can really only imply that a special FF is coming. This appears to be that car. So I'm just going to run down some points of why you should be excited for this car. It has a front-mounted V12 with more than 6 liters in capacity and more than 650 horsepower. I'll steer clear of actual figures, as Ferrari may modify this particular car. It has a top speed of over 200 miles an hour. It doesn't have the FF's hideous grille that looks like a mouthguard. So there you have it, what is in all likelihood Ferrari's next one-off. It will be one of the weirdest, coolest, rarest cars Ferrari's ever made.